(Columbus, Ohio — May 9, 2017) – CEO pay for major Ohio companies continues to be egregiously inflated when compared to the wages of the average worker in the state, according to the new AFL-CIO report, Executive PayWatch. 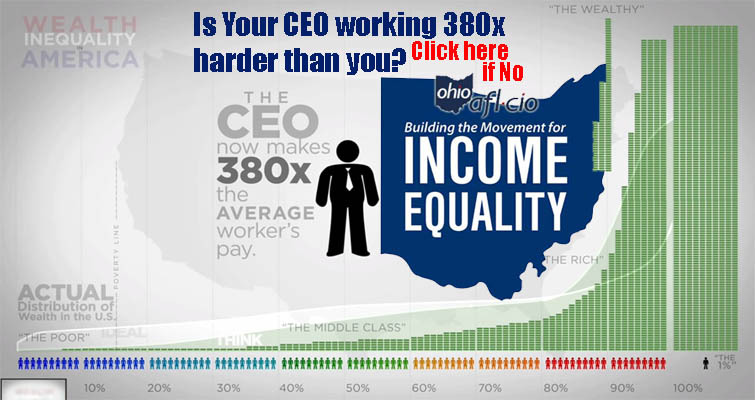 The average CEO of an Ohio S&P 500 company made $10.9 million per year in 2016 – more than 290 times more money than the average rank-and-file worker. The Executive PayWatch website, the most comprehensive searchable online database tracking CEO pay, showed that in 2016, the average production and nonsupervisory worker earned approximately $37,600 per year. When adjusted for inflation, the average wage has remained stagnant for 50 years. “The income inequality crisis in our country continues unabated,” said Ohio AFL-CIO President Tim Burga. “Our economy continues to be rigged by those at the top and working people continue to pay a big price,” he said. “These findings highlight the need for a greater emphasis on strong collective action to ensure that wages rise, rights get restored, and workers finally get the dignity and respect they’ve earned,” Burga said. The report lists the pay for many Ohio CEOs including Richard Kramer, CEO of The Goodyear Tire & Rubber Company, who topped the state list by making $19,798,104 in 2016.